From the Logan Shoals Vista Point on the east shore of Lake Tahoe, you’re afforded unobstructed, panoramic views looking west across the lake. Therefore, Logan Shoals makes for a perfect place in which to view sunsets at Lake Tahoe. Some of the most appealing aspects of visiting the Logan Shoals Vista Point is that the parking is free and located directly off of HWY 50, making access to the vista point and the short hike below it quick and easy. Although I wouldn’t plan my entire day around stopping at Logan Shoals, I would definitely schedule it either before or after dinner (depending on what time you eat) in order to witness a beautiful Tahoe sunset. Click on the above map to enlarge it for better viewing and printing. This map is only for reference and shows the general route to the Logan Shoals Vista Point and the short hike below it. Always carry a traditional topographic map and compass when traveling in the backcountry. On the east shore of Lake Tahoe just north of Cave Rock look for a relatively wide pullout. The pullout is located on the west side (lake side) of HWY 50 and features a sign indicating “Logan Shoals Vista Point.” As you might expect, this is where you’ll park. The only considerations when parking at the Logan Shoals Vista Point are … don’t block the service road gate and don’t parallel park. This parking area is wide enough that you can park nearly perpendicular to HWY 50 without fear of obstructing highway traffic. Most people park at an angle and as close to the next vehicle as possible so as to maximize the parking area. This pullout does taper off at either end, so obviously park according to the space you have available with which to work if the majority of spaces are occupied. Here’s a map to help you find the Logan Shoals Vista Point. There are a couple of different vantage points in which to see across Lake Tahoe from the Logan Shoals Vista Point. I’m particularly fond of the one that features the infographic that illustrates the visible mountain peaks located across the lake (on the west shore). However, the paved walkway continues a little further to a rock outcropping in which to view Lake Tahoe. For capturing amazing panoramic shots of Lake Tahoe from the rock outcropping, walk past the public toilets to a circular-shaped resting area (with three stone benches). Then, find the footpath on the north side of the circular area that leads up to the highest point among large granite boulders. As always, exercise care when maneuvering around boulders. The short hiking trail below the vista point (that I mentioned in the introduction) also begins at the circular-shaped rest area. However, instead of taking the footpath that leads up to those large granite boulders just north of the benches, hike down toward the lake using a small trail along the south side of the rest area. You’ll descend approximately 175 feet and find yourself on a relatively flat and wide trail that travels in either direction (north or south) of the vista point. This trail is most likely the original road that people used to drive along the east shore of Lake Tahoe and around Cave Rock. There’s no right or wrong answer with regard to which direction you travel from this point. The total distance along the path is a mile or less and, ultimately, you’re just going to run into private property on either side. For the most part, however, the best views of Lake Tahoe from this path will be at points closest to your starting location (i.e. the trail leading down from the rest area). The only place that you can safely navigate your way down to the actual lake is located a few hundred meters to the south of the starting point. Otherwise, you’re mostly going to be overlooking the lake from this trail. I apologize for stating the obvious, but be careful when hiking down the 175 feet from the resting area. The trail is a bit steep and there are a handful of rocks covered with dirt and sand you’ll have to negotiate. I see so many people take for granted walking across this kind of stuff, only to wind up slipping and falling because they don’t realize just how slick sand on stone can be. Mostly it’s the little kids that go skidding across the rocks, but I’ve also slipped once or twice. 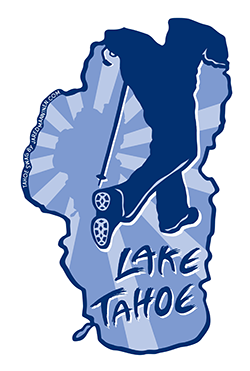 For the curious … according to the book Tahoe Place Names: The Origin and History of Names in the Lake Tahoe Basin, Logan Shoals was named after Robert Logan. He and a partner had owned and operated a short-lived but successful hostelry in the 1860s in nearby Glenbrook. A “shoal,” if you’re unfamiliar, has many variations to its meaning but as a general oceanography term it’s thought of as a type of sandbar (that ultimately poses a threat to watercraft).